Babe Ruth is the greatest player of all time. Period. He is the greatest hitter ever; his .690 career slugging percentage is 82 points higher than Reggie Jackson's best season. Ruth dominated his era like no one else: His 54 home runs in 1920 were more than the next three players in his league combined, and only one American League team outhomered him that year. He was the first player to hit 30, 40, 50 and then 60 homers in a season. When he hit his 138th career home run, he became the all-time home run leader -- the 576 yet to come only added to his record. When he reached 700, no one else had half as many. But Ruth was more than a home run hitter; he was a tremendous athlete. 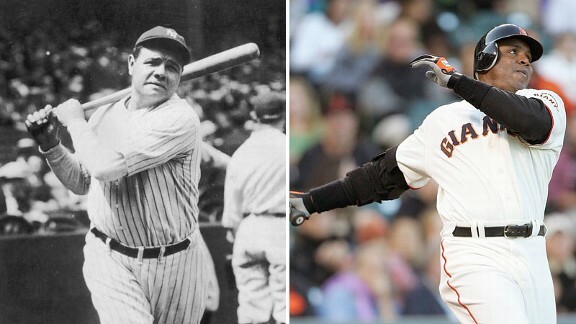 He stole 123 bases in his career, 93 more than Joe DiMaggio. He hit 136 triples, more than any active player at the time and 130 more than Mark McGwire had in his career. And before his career as a hitter, Ruth was the best left-handed pitcher in the American League. He went 94-46 with a 2.28 ERA and had as many shutouts as Pedro Martinez (17). What's more, Ruth's power and charismatic play rescued the game in the aftermath of the Black Sox scandal. Burt Hawkins, one of the great sports writers ever, was once asked to name the best player he'd ever seen. "I'll take Babe Ruth," he said, "And you can have the next three." OK, I get it. Babe Ruth was a force of nature unlike any the game has ever seen, a man with a prodigious swing on the field and a prodigious appetite for women, food and drink off it. Ruth led his league in home runs 12 different seasons and could even pitch a little. But he played his first major league game nearly 100 years ago. That's not a generation or two ago; that's a different time, when professional sports were still in their infancy, when the U.S. population was one-third what it is now. In sports, the quality of competition improves over time. The athletes get bigger and stronger, training methods improve and the pool of competitors grows. During his time in the National League, Barry Bonds faced 228 pitchers who threw at least 300 innings and were 6-foot-3 or taller, and just 26 who were shorter than 6 feet. Ruth faced 20 pitchers 6-3 or taller and 69 shorter than 6 feet. Yes, there were more teams and pitchers in Bonds' era, but you get the idea: The pitchers Bonds faced were bigger, stronger and threw much harder. Ruth dominated a lesser level of competition. Bonds was the more complete player. He is the best defensive left fielder ever (eight Gold Gloves) and owner of 514 career steals. And he wasn't too shabby with the bat. Yes, PEDs. But Bonds won three MVP Awards before his alleged PED use began -- and should have won three or four more. He was the best player in baseball.